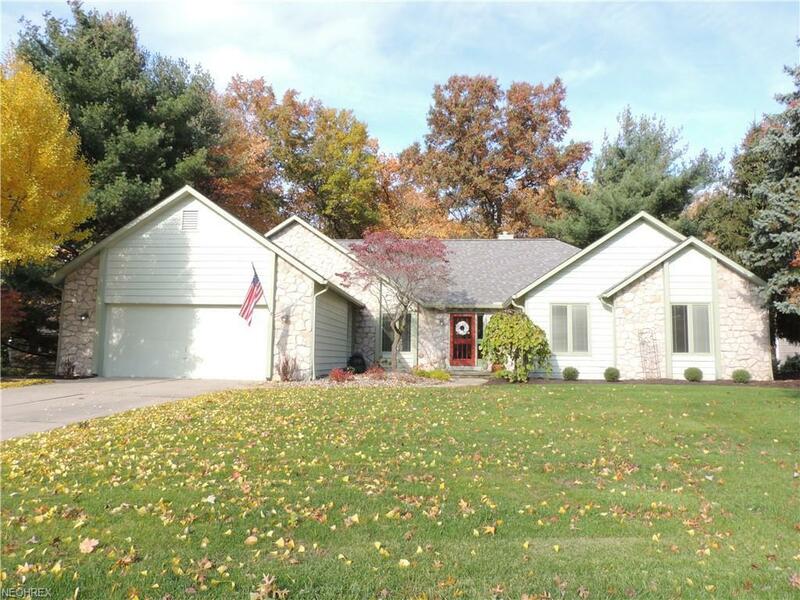 KOPF built 4 bedroom, 3 full bath RANCH w/ a 2 car attached garage on a half acre lot in WESTWINDS! Fabulous flowing floorplan truly perfect for entertaining family & friends... Marble foyer. Vaulted ceilings. Hardwood flooring. Cozy Living Room with custom built bookcases. Formal Dining accommodates large or small gatherings. Gourmet Kitchen, custom maple cabinetry, granite counters, ss appliances, pot filler system & 3 ovens! Center Island with sink & seating for 4 PLUS a custom built breakfast bar too! The family room flows from the kitchen with vaulted ceilings, skylights with a gas fireplace. Master bedroom is fit for a "king or queen" with a custom built dresser, & walk-in closet. Glamour bath with glass tile shower, private water closet, soak tub, dual vanities with heated ceramic flooring! Bedrooms 2 & 3 are down the hall and a full bath complete this level of living. Down the basement step upon the new cushy carpeting into the family/media room, slide the barn door into the custom built bar/game room. From here enter abundant storage space or find the utility room where the mechanics for the home are located. Additional living space provides a 4th bedroom/guest bedroom PLUS another (3rd) full bath! The exterior has been freshly painted, lot is landscaped with a spacious 18' x 36' wooden deck with a gazebo to enjoy the outdoors. WESTWINDS amenities include pools & tennis courts with nearby parks & walking paths. YOUR SEARCH IS OVER!